From a Mothers Perspective..: Going home! Alexis has done SO well they feel comfortable releasing her just FOUR days post op! I was not expecting (yet hoping) that we would be leaving so soon. Her tiny body bounced back quicker than I imagined and you would never guess that the girl JUST had surgery! She has only requested Tylenol twice since being taken off of the pain pump. Such a trooper! The only requirement we must meet before being discharged is meeting (once again) with the G.I department. I will get to discuss how we will treat Alexis from here on out. Not sure at this time if they will request probiotics or anything of the sort-- but we shall see! I will update again within the next few days! My little J-Pouch Beauty Queen--first post op meal! My name is Kortney. I was diagnosed with cerebral palsy at 10 months old and spent a lot of time in and out of doctors and hospitals over the last 22 years of my life. My list of diagnosis stretches for long and I have had 13 surgeries, 8 of those in a year and a half. 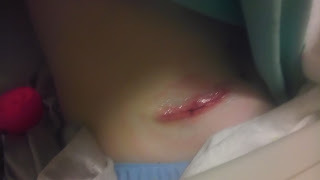 So I know what it is like being stuck in the hospital and having lots of surgery especially when you are so little. My husband and I wanted to send little Alexis a get well package as well as a card and a few thing. If this is alright with you, would you please email me the address that would be best to mail the package for Alexis to? My email address is mcgee2324@gmail.com. You can also text me at 406-781-4427. I wish you guys all the best and am praying for you all, especially little Alexis. I don't have to tell you how much of a trooper she is. And she is absolutely gorgeous as well. I love that she is always smiling, even in the hospital and at times when she is not feeling her best I imagine, she still smiles. What an inspiration she is. Should your family need any help, financially, with transportation, help finding good doctors or advice on meds or diets or anything at all, please feel free to get in touch with my husband Jared and I.